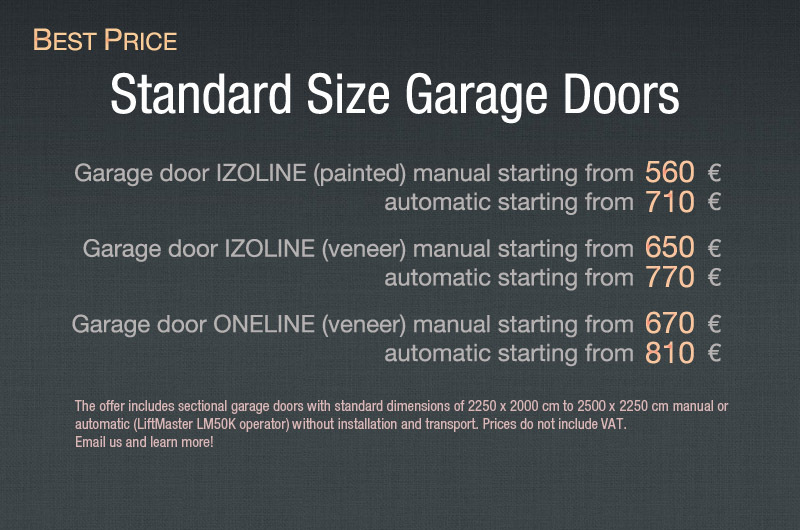 Do you want to know how much will your garage door cost? We offer garage doors that are characterized by reliable quality, and a wide range of designs and colors makes them a decorative element of any building. WWT garage door will make you feel safe and comfortable. Each door is manufactured on individual order. Very high quality components, precision workmanship and a wide range of different additional options allow us to meet the highest requirements and enable the implementation of non-standard technical projects. We have a full range of operators for sectional doors, as well as swing and sliding gates. Proven technology of our operators systems from companies such as Chamberlain LiftMaster, Sommer and Nice ensure your comfort and safety and make your gateway obtain full efficiency. During many years of our activity we had the pleasure to handle projects for large institutions such as the Polish Army and the State Fire Service. Nevertheless, the most of our experience we gained during daily work for private companies and individual clients. We offer garage and industrial doors, along with expert advice and installation. These doors are characterized by attractive design, and a wide selection of styles and finishes, along with the fact that they can be painted in full RAL color palette, results in that our doors are very attractive for a variety of applications. Proven technology of our automation systems produced by companies like Chamberlain LiftMaster and Sommer ensures safety and convenience. To meet your expectations, we will negotiate our rates and offer you flexible terms of cooperation. Our company means a professional consulting, service and installation! Thank you. We will reply in next 24h. For other transport or service information please give us a call or write an email.